How to use IO payments to save a fortune. Enter the dollar amount of the home loan (principal amount), but without the dollar sign and any commas. Enter the number of years you will be making the interest-only payments. Enter the annual percentage return you expect to earn on your future investments. Enter as a percentage without the percent sign (for 6%, enter 6). Based on your entries, this how much your monthly interest-only payment will be. This does not include property tax or insurance payments. Based on your entries, this is what your monthly payment will increase to once the interest-only payment period has expired. Based on your entries, this how much interest you will pay on the interest-only home loan after making all payments for the term entered. Based on the interest-only payment amount, this is the size of a principal and interest home loan you could take out for the same monthly payment. In other words, at this loan amount you would be making the same payment as the interest-only payment amount, but in this case you will be paying down on the principal balance instead of letting it sit there to earn interest for the mortgage company. This is how much interest you would pay if you purchased a smaller home with the more affordable loan amount and made monthly principal and interest payments. This is how much interest you could save from buying a smaller home with a more affordable loan amount and making principal and interest payments versus a larger loan amount with interest-only payments. If you invested the difference between the post-interest-only payment and the interest-only payment, this could be the future value of your investment once the home loan is paid off. This calculator will calculate the before and after payments and the total cost of an interest-only home mortgage. Plus, the calculator on this page will also calculate the investment earnings lost by not choosing a principal and interest (PI) payment loan (discussed on the Learn tab). Note: If you only want to calculate a house payment that includes, principal, interest, taxes, insurance, and PMI, please visit the PITI Mortgage Calculator. Enter the home loan amount. Enter the annual interest rate of the house loan. Enter the number of years you will be making just interest-only payments. Enter the percentage return you would expect to earn on your future investments. Tap the "Calculate Payments" button and scroll down to view the results. What an interest-only loan is, and an alternative that will save you a boatload of money. In case you're not familiar with it, an interest-only home loan (IO) is one that for the first several years of the loan term you only pay the finance charges as they come due. In other words, during this portion of the loan "repayment" the amount you owe to the lending institution stays the same as it was before you made your first payment. Of course, after the IO payment term has expired, you will then need to convert the IO loan to a conventional PI mortgage, wherein you actually begin reducing the amount you owe to the mortgage company. And because you will be paying down the principal, the amount of your monthly mortgage payment will increase (is that something you want to look forward to?). Looking at it another way, an IO home loan is a cleverly-devised home financing method that allows a real estate company to sell you more home than you can afford, while allowing the mortgage company to earn finance charges on higher loan balances that would not exist if home buyers only bought homes they could afford. Ironically, the same mortgage company that accuses you of throwing money away by renting, has no problem at all with you sending them pure finance charge payments that buys you absolutely nothing. I for one wish they would call IO home loans what they really are, "Rent to Buy" offers. Here is what I suggest to people who inquire about IO home loans. 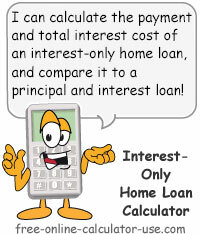 First, calculate the IO loan payment using a calculator like the one on this page. Next, determine the size of a conventional mortgage that would result in a PI payment equal to the IO payment (the interest-only home loan calculator will do that for you). The result will be a house that will be more in line with what you can actually afford -- provided you have accurately forecasted the ongoing costs of owning the house (insurance, property taxes, utilities, maintenance, repairs, replacement costs, commute costs, etc.). By reducing the size of the mortgage to allow you to make PI payments equal to the IO payment, at the end of the IO payment period your mortgage payment will remain unchanged. This results in a monthly savings equal to the difference between the IO payment and the higher post-IO payment. Furthermore, because you are buying a smaller, more affordable home, you will start saving money immediately in the form of reduced house ownership costs (insurance, property taxes, utilities, etc.). Use it to your mortgage to pay it off early. Use it to pay off high APR debt. Invest it to earn interest on finance charge savings. Combine it with the equity you are building and trade-up to a bigger house without having to borrow more money. The possibilities to save (earn) money using this idea are endless.